(Release Date: August 12, 2014)  1971's "Bedknobs and Broomsticks" is often compared to 1964's "Mary Poppins," and it is easy to see why. Both were produced by Walt Disney Pictures, both involve children cared for by a magical stranger, both combine live-action and animated creations into the same frame, both were directed by Robert Stevenson, both feature original songs composed by Richard M. Sherman and Robert B. Sherman, and both are based on children's literaturein this case, Mary Norton's stories "The Magic Bed Knob; or, How to Become a Witch in Ten Easy Lessons" and "Bonfires and Broomsticks." Angela Lansbury stars as Eglantine Price, a secret apprentice witch who begrudgingly agrees to care for children Charlie (Ian Weighill), Carrie (Cindy O'Callaghan) and Paul (Roy Snart) when they are spirited away from London during the World War II Blitz. The kids aren't there for a night before they stumble upon Eglantine flying through the air on a broom. When Charlie tries to blackmail his new guardian, she enchants a bedknob that will transport them via her antique bed to any location they wish to go. Their journey takes them to London, where college headmaster Emelius Browne (David Tomlinson)actually a skillful con artistis in possession of a coveted spellbook he believes to be rubbish. When the second half is discovered missing, Eglantine, Emelius and the children set out to locate the missing pages. 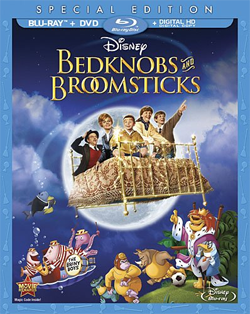 "Bedknobs and Broomsticks" doesn't hold up next to my fond, if limited, childhood memories of the film. It is very much a lesser distaff version of "Mary Poppins" with erratically placed, mostly disposable songs (only "Portobello Road" is memorable) and a barely-there plot lacking in urgency. The incorporation of Nazism into the story is joltingthis would never fly in a Disney fantasy made in 2014and director Robert Stevenson's unwillingness to commit to exploring the real-life horrors and insinuations of its time and place renders this aspect of the picture ill-advised at best and irresponsible at worst. It is also odd that the three siblings in the story do not once mention their parents or what happened to them, and are ready by movie's end for Eglantine and Emelius to adopt them. With all of that said, Angela Lansbury is a delight as Eglantine and the film's embrace of the fantastical opens things up for the occasional nice moment of whimsy. Technically, there is much to explore and admire about "Bedknobs and Broomsticks"the art direction by Peter Ellenshaw and John B. Mansbridge is lavish and lovelybut dramatically it leaves a regrettably indifferent mark. Disney has dusted off "Bedknobs and Broomsticks" for its grand high-definition entrance, but it wouldn't have hurt for their 1080p transfer to be given a more extensive scrub and remastering. Detail and clarity are certainly superior to any past home video presentation of this title, but a host of issues pop up every time there is an effects shot. In these moments, no doubt in part due to the antiquated opticals used, mosquito noise runs rampant, grain appears chunky, and sporadic specks and dirt rear their ugly heads. Colors, however, are accurately resolved, even rejuvenating, and black levels are mostly solid. This is a good transfer, but it could have been better had a little more care been brought to it. The 5.1. DTS-HD Master Audio is front-heavy yet satisfying. This is a comfortable, lived-in sound mix divvying out just the right amount of attention to the dialogue and soundtrack. Some movies from childhood hold up when they are seen years later as an adult, and others do not, trapped only in the nostalgia of the time in which they were first watched. Though "Bedknobs and Broomsticks" falls into this latter category for me, others may have a different reaction and love it just as much as they always have. Kudos to Disney for releasing the film to Blu-ray; hopefully it is a sign of things to come because there are countless live-action releases from the studio that are in desperate need of the high-def treatment (I'm looking at you, "The Parent Trap" (original and remake), "Freaky Friday" (both versions, too), and "Pollyanna"). Recommended for fans, but temper expectations.